This month, we’re featuring rosé wine, as there’s truly nothing more refreshing for spring celebrations and dining! And truth be told, America has fallen in love with rosé wines; it’s one of the fastest growing segments in the US wine market. Here’s a perfect recipe to pair with your favorite Temecula Valley Rosé. Tender grilled chicken is enhanced with a dazzling lemon vinaigrette. Callaway Vineyard & Winery ~ 2012 Special Selection Rosé of Sangiovese – A summery bouquet of rosy red fruit and flowers: strawberry, cherry, raspberry, rose petal and cherry blossom fill the nose and palate of this perfect warm weather wine. Hart Winery ~ 2014 Rosé of Tempranillo – Delightfully fruity, bursting with strawberry, watermelon and spice notes. Oak Mountain Winery ~2013 River Rhodes Rosé of Syrah – Blast of strawberries and tropical nuances in the nose with a smooth wild berry character on the palate. Wine & The Super Bowl? You Bet! Sure, wine may not be the first image that comes to mind when planning your Super Bowl celebration, but we’d bet that we can convince you that it should be! Of course, when it comes to wine, we sure have a hard time imagining any celebration without it. Hot Wings ~ Riesling makes a good choice here….it will temper some of the heat of the wings! Pizza ~ Mmmm….pizza! How about trying a Barbera with that? 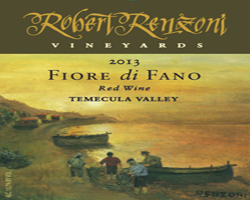 We’d suggest: Europa Village 2013 Estate Barbera, Hart Winery 2012 Barbera or Ponte Family Estate Winery’s 2013 Barbera. 7 Layer Dip ~ Our favorite pairing for foods with Mexican flavors? Malbec! Burgers ~ Those of us in Southern California are lucky enough to be able to grill on most Super Bowl Sundays. If you get that lucky, why not grill up a burger and enjoy with a hearty glass of Chardonnay? So, as you can see, wine and Super Bowl fare really are a match made in football heaven! Posted in Events, Wine Pairing Guide | Comments Off on Wine & The Super Bowl? You Bet! This succulent rib roast served with peppery herbed ricotta cheese sounds absolutely delicious and would be the perfect meal for a chilly Sunday night! You’ll want to pair with your favorite Temecula Valley Cabernet Sauvignon or Merlot. 2. Place the meat, bone-side down, in a 2- to 3-inch-deep roasting pan. 3. Place the pan in the oven and roast for 15 minutes. Reduce the oven temperature to 350°F and roast for 2 more hours, or until the internal temperature reaches 125°F at the center of the meat. Callaway Vineyard & Winery ~ 2012 Wild Yeast Cabernet Sauvignon – Dried blueberries, dark cherry and small black currants with liberal lashings of baking spice. Oak Mountain Winery ~ 2010 Oak Mountain Merlot – A soft nose, with flavors of raspberry, blackberry, and plum with abundant smoky oak. Ponte Winery ~ 2009 Cabernet Sauvignon – Hints of black currant, plum, cherry and oak. Wilson Creek Winery ~ 2011 Family Reserve Merlot – Firm yet subtle tannins play with the earthy fruit of plum and black currant, soft and supple and lingering finish. Saturdays in August / 11:30a-2:30p / Live music on patio / Half price Sangiovese, Sangiovese Sangria and special menu items. Every Sunday / 11:30a-2:30p / Bring your well-mannered pooch to lunch, doggie treats and special menu items / Live acoustic music on the patio. Grab your friends and join us for a marvelous time! Friday’s from 3:00p-6:00p in the lounge at Meritage at Callaway. 20% all tapas, $2 off wine by the glass, 20% off bottles of Callaway wines and available domestic, import and craft beers. Every Sunday at Meritage at Callaway from 4pm-8pm in the main dining room. Enjoy sipping on our very own Watermelon Sangria while soaking in the sunset vineyard views. Live music from local musicians begins at 6pm. No cover charge. Reservations for parties of 5 or more are required. Friday Night Live Music / 5pm-8pm / Wine by the glass or bottle purchase available / 9/4 Vini Contreas, Rock, Folk, Christian / 9/11 Frankie and the Invisibles, Instrumental Rock & Roll / 9/18 Kenny Hale, Rock & Blues / 9/25 Vini Contreas. Labor Day Celebration / 12pm – 3pm / Saturday – Monday / Sept. 5-7 / Case sales, Free Concerts / Saturday, Harmony Road, Sunday, Danielle Taylor / Restaurant special $55 per couple / 50% off carafes / BBQ in yard garden with hot wings special! Sunday, Sept. 6 / 12:00p-4:00p / Indie / Blues Americana / The Reserve Room will host a variety of live musical artists the first Sunday of each month in 2015. *The Reserve Room is a tasting room for wine club members only. Join the Wine Club and enjoy complimentary tastings in our exclusive venue. Friday, Saturday and Sunday nights, 6p-8p / Join us for extended hours in the Tasting Room Friday, Saturday and Sunday nights this summer! $30 ticket gives you access after hours from 6:00p-8:00p and includes a bottle of South Coast wine to take home. Call 951.587.9463 ext. 7261 for more information. Sunday 9a-10a, Monday 10:30a-11:30a / $12 per class / Yoga mat, towels and water provided. Call 951.587.9463 ext. 3513 to reserve your session.